It’s time for another giveaway! This time the giveaway is sponsored by OXO. They are giving away one handheld Mandoline slicer to one lucky winner. But I will get back to the giveaway details in a while. At first let’s talk about the sandwich that I love the most. Food connects to so many memories in our life. Every recipe has a story, so does this one. Say for example from how it makes you feel when you miss your mom’s comfy food to the food we ate when we went on camping or something like that. Just like that, this sandwich recalls some special memories in my life. Back in Idaho, when I was dating V, he used to make this sandwich for me for lunch. I was kind of impressed with his effort of making food at home and that to from scratch and even inviting friends for lunch/dinner. So since then I am a big fan of this sandwich, and I only enjoy it when V makes it. 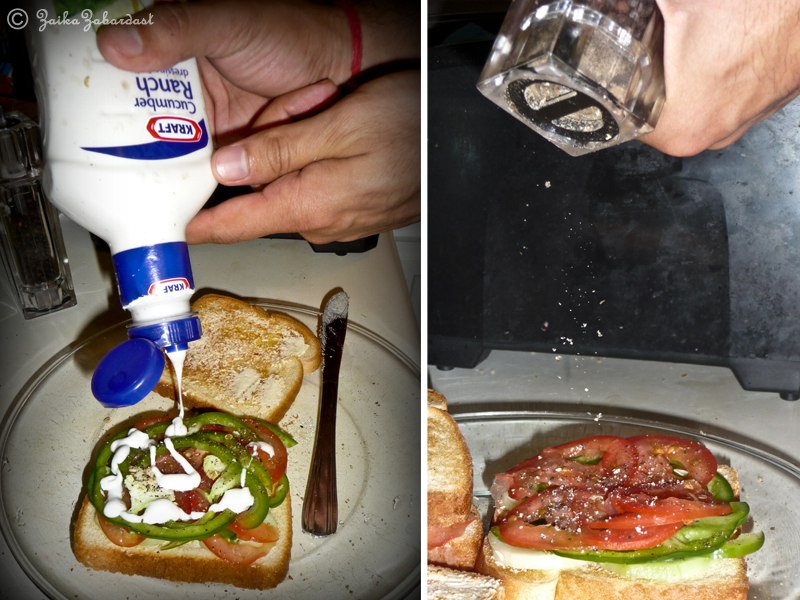 This sandwich is very easy to make. But I can’t make it as good as V does. And that is why I still always ask him to make it. All you need to do to make this sandwich is lightly toasted bread, butter, cucumber ranch, salt, pepper and fresh vegetables like cucumber, green bell pepper, tomatoes and onion. 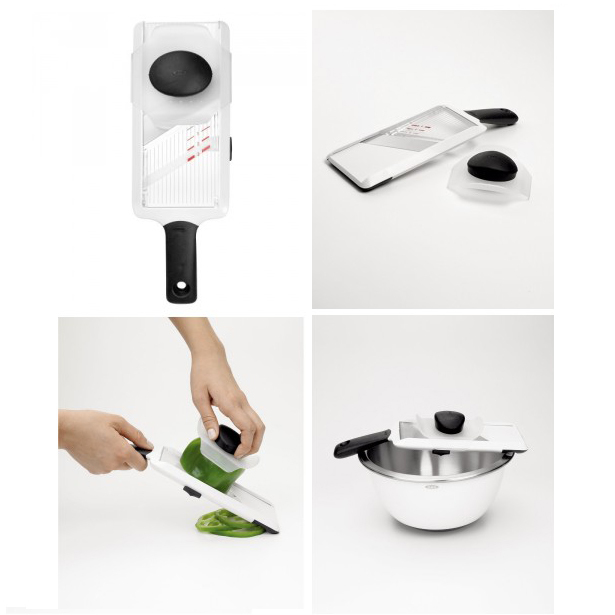 Slice them very thinly – and here you need help from OXO mandolin slicer. It does the hard work for you in minutes. It has 3 different thickness size options that you can select according to your choice. Whether you want to make quick salad or pie or tart…it saves lot of your time and it is handy. Getting back to the recipe, lightly toast the bread you like, apply butter on both the slices. Now arrange sliced vegetables layer by layer and season with salt and pepper. Drizzle some KRAFT cucumber ranch (do not skip on this sauce, this sauce is magical). Cover with another slice of bread and enjoy with tea or coffee. This giveaway is sponsored by OXO. They are giving away one Handheld Mandoline slicer to one lucky winner. This giveaway is open until Thursday (06/07/12) 11:59 pm (your time). I will pick ONE lucky winner on Friday (06/08/12). Tweet about this giveaway saying: “I just entered to win OXO Mandoline slicer from ZaikaZabardast http://wp.me/pTI6E-u0 @zaikazabardast @oxo” or something like that. ← Vegan Pineapple curd and Beanilla Vanilla beans GIVEAWAY! I would love to win the mandolin slicer. I love salad with veggies that are cut paper thin. I also love pickled onions and cucumbers. The thinner sliced they are, they better they seem to be. But with the mandolin slicer, I’m going to make ratatouille! I’ve been itching to buy a mandolin… This one would be great, OXO makes pretty good products. …it’d sure make slicing veggies for salads and pizzas so much easier! And, I now follow you on twitter! m tweeting about it too! 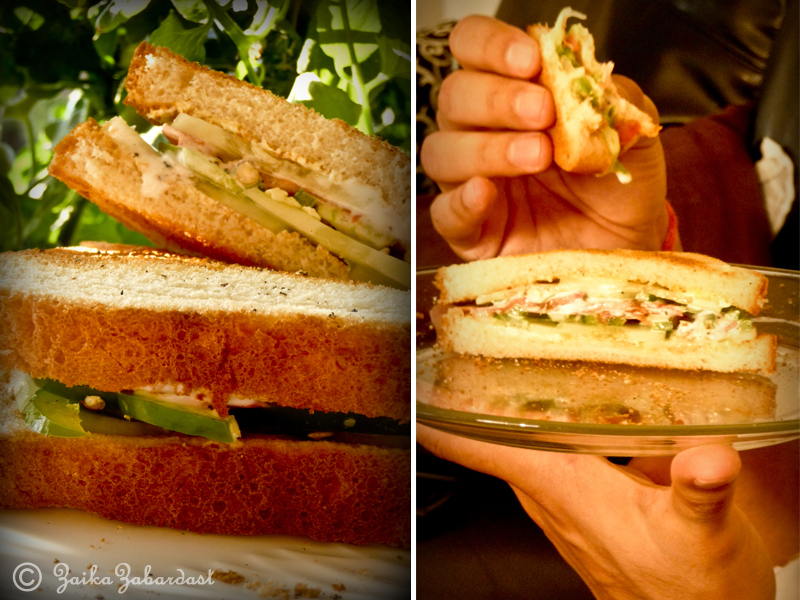 Grishma, I love sandwiches especially in the summer. No turning on the oven for dinner, just a bit of toasting. We make sandwiches with our panini grill all summer with fresh tomatoes. Your sammie looks great. This sandwich idea sounds tasty, though I try to avoid most bottled salad dressings now – I bet tzatziki would be good, too. If I had a mandoline I’d cut cucumbers in a snap! And apples! And onions! I’m following you on pinterest, too! I’m a follower of OXO on twitter! well, vanilla ice cream or pudding, right? 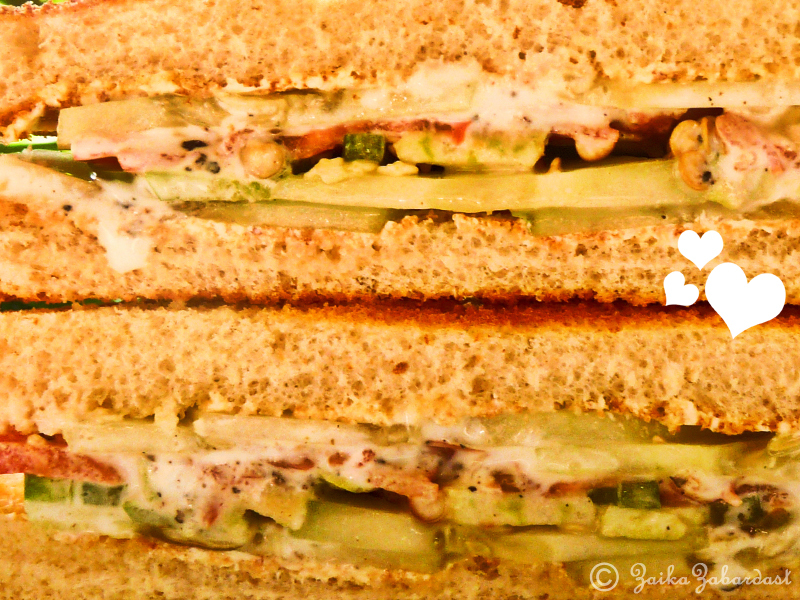 I really loved your sandwich reciepe and with the help of OXO slicer it can be very easy to use good number of sliced veggies in sandwich. Thanks for the reciepes Grishma. this mandolin slicer looks neat! i would make some sweet potato fries first!